Corpse Bride takes place in a nineteenth-century european village and tells the story of Victor, a young man that is kidnapped to the Land of the Dead and forced to marry the mysterious Corpse Bride while his true bride desperately awaits him in the Land of the Living. Although the afterlife reveals to be much more interesting than the life he had in the Land of the Living, Victor realizes that there is nothing in this world (or the other) that can keep him away from his true love. Corpse Bride is a musical animated film that transmits a message about two different ways of living and in a humoristic way criticizes the society of the nineteenth-century. 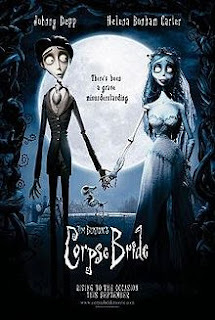 Like in other Tim Burton’s films the dark humor and the music play an important role, making Corpse Bride a story with a funny and dark atmosphere. This is my favourite animated film and I recommend it to all of Tim Burton’s fans and to all the people who enjoy a good story full of music, passion and humor.